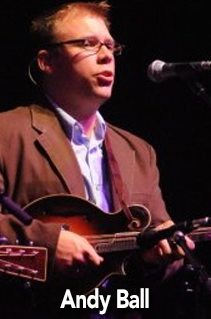 Andy Ball is a mandolinist, mostly known for his work with Mark Newton (2005-2006) and the Lonesome River Band (2006-2011). Born and raised in Metropolitan Detroit, he is third generation of Appalachian immigrant and was brought up playing Bluegrass music with his father and grandfather. As a college student, Andy worked for renowned Bluegrass songwriter, Pete Goble, mostly by recording demos of many of Pete’s songs. Later on, Andy recorded “Hillbilly Hemingway” (2006) with Mark Newton as well as “No Turning Back” (2008) and “Still Learning” (2010) with the Lonesome River Band. He holds degrees in philosophy and is currently finishing a PhD in philosophy at the University of Alberta in Canada where he also works as an undergraduate lecturer.